The PacSafe Coversafe X75 is discreet, as it is soft and secure, the Anti-theft RFID Blocking Neck Pouch can be worn under clothing, while the slash resistant, wire reinforced Carrysafe® Slashguard Strap and RFID blocking material (freq:10MHz to 3GHz) add an extra layer of security so you can worry less and enjoy more. 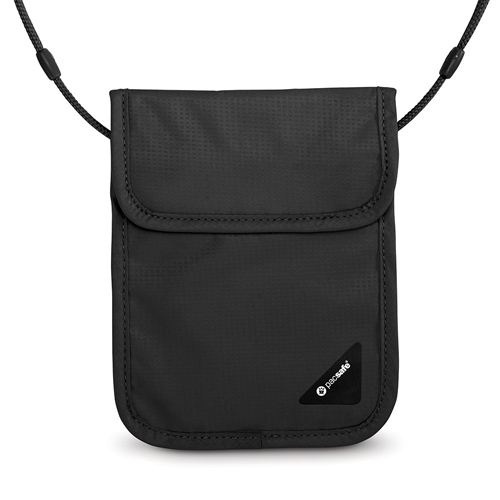 Shoulder strap (Drop Height) : 11.4" - 24.4"
The Pacsafe Coversafe X75-Black has many exciting features for users of all types. You can extend the lifetime of your Pacsafe Coversafe X75-Black with the purchase of a FactoryOutletStore Factory Protection Plan. See the Pacsafe Coversafe X75-Black gallery images above for more product views. The Pacsafe Coversafe X75-Black is sold as a Brand New Unopened Item. I have traveled Europe and the US in critical areas where pick pockets are very busy looking for opportunity to take your valuables. I have traveled yearly over the past 18 years and used this product on every trip. I much prefer this product over fanny packs as it is discrete. No one ever knows where my passport or funds are with this Pac. I have never expereced a loss. Fantastic product that after all these years is as good as new and the product works. .